Wright Chat :: View topic - Rare Max Hoffman pics / Enjoy! Rare Max Hoffman pics / Enjoy! Posted: Fri Jun 13, 2008 9:58 pm Post subject: Rare Max Hoffman pics / Enjoy! Too bad about that safety fence. Couldn't a pool cover be used when children are present ? That carpet is so bright and busy it probably belongs on a wall in a museum, not in a calm residential interior. . .but that's just my opinion. Hoffman rug at Taliesin -- 1955 ? 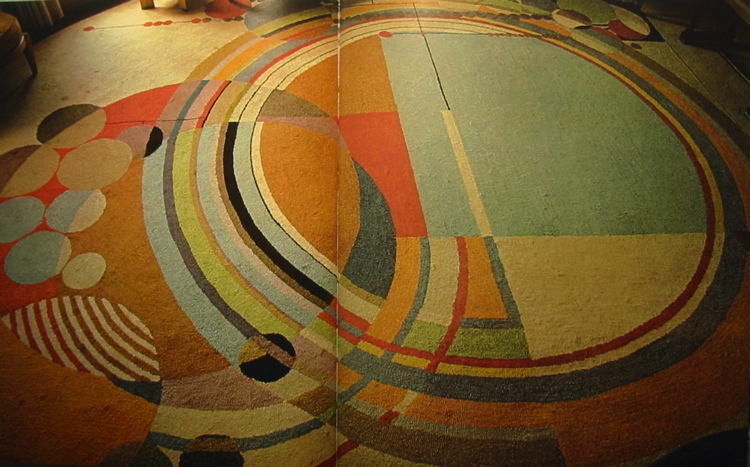 rug at David Wright residence -- 1950 ? Agreed; and interesting when compared to the tasteful early carpet designs that didn't over power the effect of the art glass (over compensating when plate glass became the norm?). I will say these later graphic expeditions predate the flights of fantasy we painted on the walls of the chicken coop my band practiced in during the late sixties! In addition to the safety of small children--an issue more important than aesthetics--might the fence also be a result of building codes? I have no sense of the Hoffman site, or whether the property is fenced off from other properties with a larger perimeter structure. In many municipalities, however, you would not be allowed to have a pool without a safety fence around it. (Having just added a pool, our humble burg required a fence, self-closing gates, and alarms on all exterior doors leading to the backyard). I've heard from others that safety pool covers are an enormous hassle (as opposed to a fence), but I have no experience with them myself. Well, the assumption is that all those code requirements have one purpose -- the safety of small children ? I wonder who is the author of RJH's text on Max Hoffman. The Hoffman grounds are extensive, especially on the pool side. The fence, which does not seem insurmountable by anyone older than 3, is a code requirement. I see many photos of pools without fences. Perhaps those are homes without small children. If the present owners of Hoffman do not have children visiting, perhaps the fence could be removed. It was certainly not designed in a way that would enhance, or even complement, the house, in my view. It doesn't appear to have been "designed" at all, in fact. Too bad horizontal rails are so much more vulnerable, and accessible, than vertical staves ! It appears that the house may have been intended (by Mr Wright ?) to be built much closer to the water. . .?